Put cashews in microwave (or under grill) and quickly brown. Watch carefully as they don’t take long. Leave to one side. 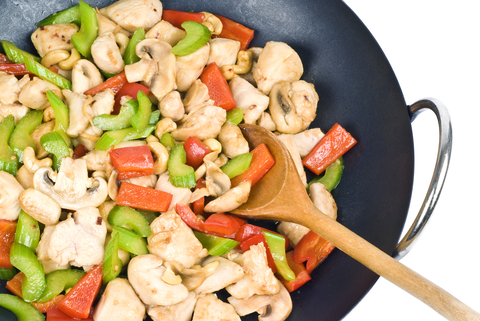 Spray wok or non stick pan with cooking spray and saute garlic, ginger (if using) and chicken until cooked. Remove from pan. Spray pan again and add onion, capsicums, mushrooms and carrots, cook for about 3 minutes and then add chicken and garlic mix back to pan. Mix cornflour with water and add to pan together with chicken stock powder, sauces, sugar and salt and pepper to taste. Stir well until sauce thickens. Sprinkle cashews over top of each serving and serve with plenty of vegies like broccoli, cauliflower, beans and carrots.